This week marks the first year since the Grenfell tower tragedy which saw ‘72’ people lose their lives in the early hours of 14 June 2017, hundreds have been left displaced as a result of poor management by the government, subsequently, forcing them to rely on each other, local communities and communities across the U.K. for support. Doctors and volunteers in the area have stated several victims are suffering from mental health issues with some children experiencing post-traumatic stress disorder. Naturally, coupled with the recent Windrush scandal tensions between the working-class and the government have yet again risen to a boiling point with justice seeming like a mere dream, victims are left to rely on each other and hope. Despite being situated in the wealthiest borough of London (Kensington & Chelsea), Grenfell is among the 10% poorest areas in the country. In May 2016 the tower underwent an £8.6 million refurbishment, carried out by Rydon Construction — part of a large transformation scheme for the local estate. The building was fitted with new exterior cladding, communal heating system, and new windows. Several reports have stated that the polyethylene insulated plastic cladding that was fitted is said to be the predominant reason as to why the fire expanded so quickly. The blogger received a letter demanding the blog post to be taken down; ten blog posts had been published prior to the fire, repeatedly, exclaiming the need for a sufficient fire system in Grenfell. Evidently, the repeated cries for help fell on deaf ears; the cladding installed the renovation last year was chosen because it saved the council nearly £300,000. The Times obtained leaked emails sent to Artelia UK — construction consultants who carried out the project — from Kensington and Chelsea tenant management organisation show that, to maintain low costs, easily flammable aluminium panels were selected in preference to fireproof zinc material. 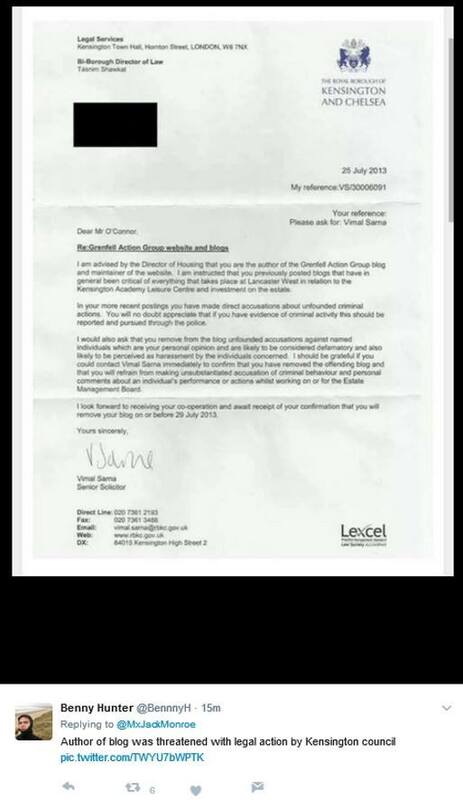 This blatant and disgusting disregard for human life was a decision put forward by Nick Paget-Brown, who had the audacity to appear on BBC Newsnight and claim that the “collective view” of the residents was against the installation of sprinklers because it would have caused a disruption to the renovation project. In the process £293,368 was saved by using “aluminium cladding in lieu of zinc cladding,” reports The Times. As for the survivors of the disaster NHS figures obtained by Sky News showed that “a total of 521 children and 2,006 adults have been seen by health teams,” and “more than 1,600 people have been identified as being in urgent need of treatment for post-traumatic stress disorder.” The NHS has been aiding those affected by the fire through services that were set up in Kensington since the fire. “The fact that so much of this housing stock has lay empty for up to six months as it is being made habitable is illustrative of the fact that many of these purchases were not suitable”. “In the last 12 months the council has failed to fully grasp this reality and has let down survivors as a result”. Initially, Theresa May rejected requests from grieving family members to diversify the panel who would sit alongside inquiry chairman Sir Martin Moore-Bick, the reason being many felt concerned over More-Bick’s ability to relate to the victims. However, a petition signed by more than 156,000 people forced the Prime Minister to include two more panel members who will join the second stage of the inquiry, which is not scheduled to begin yet. The first stage, which began on 21 May, will hear tributes from to the victims and examine emergency services repose and the night of the fire. The second stage will look at the factors of the fire such as the justification behind using the cheaper flammable cladding that aided the blaze and took ‘72’ lives. FBU will back new measures that ensures all high-rise flats have fire blankets in kitchens and a ban on combustible cladding for all building over 18 meters tall. There have been arrests over alleged fraud. Eight men and one woman have been arrested by Scotland Yard, however, there is no connection. They have stolen between £25,000 to £100,000. 11 more addressees have been raided over alleged fraud. Scotland Yard has opened an investigation over LFB and its senior officers ‘stay put’ policy; detectives are trying to analyse whether the order could have breached health and safety law. The inquiry is, currently, on hold to acknowledge the first year since the blaze and the next hearing will be on Monday 18 June at 10am with a live stream being posted here. If you need free and confidential help relating to the trauma of the fire, the Grenfell Health and wellbeing Outreach Team can be contacted on 020 8962 4393 (10am to 8pm).